My theme for the birthday party was a pirate party. I used the Wilton Little Pirate Pan #2105-2078, two boxes of yellow cake mix mixed with buttermilk instead of water and eight eggs. I used a spray for the bottom of the pan, the one that has flour. I bought white candy bark, butterscotch chips, milk chocolate chips and dark semi-sweet chips. I melted the chocolate in the microwave using the defrost setting. I added oil after stirring the melted chocolate to thin it out and so that it would stay creamy long enough for me to work with it. First I covered the whole cake with a thin coat of the white candy bark so that I’d have no crumbs. The hat is dark chocolate as well as the sandals. The gold chest is a combination of the light and dark chocolate. To make the flesh tone I used the white bark and butterscotch chips with a few drops of red food coloring. Add the coloring one drop at a time after having added the oil. If you have non-water-based coloring it is better. After putting a thick coat of chocolate on the flesh areas I went over it with my finger dipping it in oil to make it smooth. This is done when the chocolate has almost hardened. For the gold coins I washed and dried well the mold and buttered the area where the coins are. I melted the candy bark and poured it over the area. When it is hard pop it out from an edge. I then brushed the chocolate coins with gold powder found at cake decorating specialty stores (it lasts for ever so it is work the $4 to $6 price for an ounce or so). The hair is chocolate frosting and a mix of the leftover yellow and a little chocolate. I put both in the sleeve and mixed by hand so the effect would be marbled. 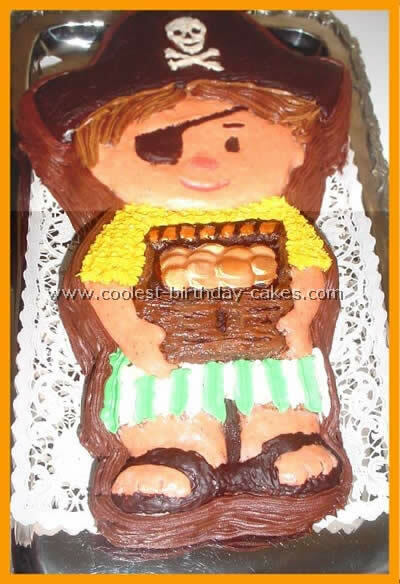 I hope you have as much fun making this for your little one as I did and that your pirate birthday turns out like ours! I made strips out of fondant for the sides of the cake. The strips were dark and light blue. 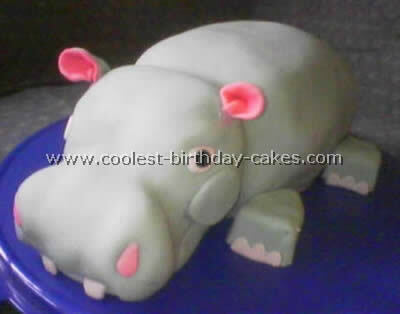 I cut out a red circle out of fondant for the top of the cakes. I then drew out the skull and crossbones out of white fondant. I made a bandana out of dark blue fondant and put the name on the bandana which was the light blue fondant. I used white dark blue and light blue fondant to make the balls that went around the top border of the cake. I used red butter cream icing and made rosettes around the bottom of the cake. This cake was fairly simple the hardest part was the strips. 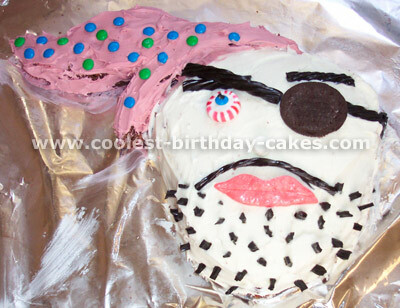 This free cake decorating idea I got from the Pirate stuff from Party City. 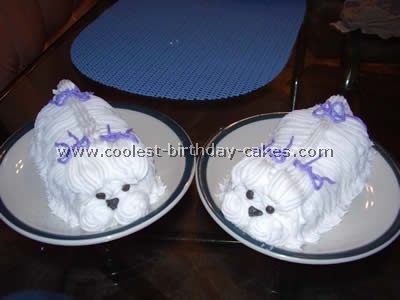 I hope that you find these two cakes helpful when you make your own cakes. I browsed the internet to get ideas then finished up with these two cakes for our pirate party. 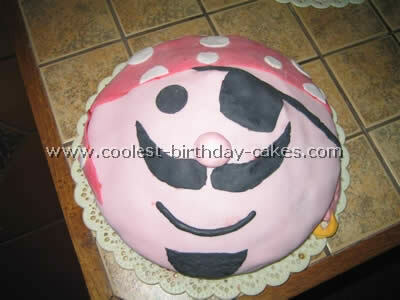 The pirate face is very simple, just a round cake and use your imagination to decorate. 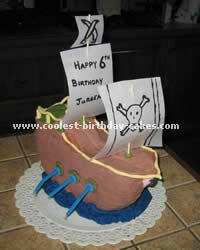 As for the pirate ship, you need a round cake cut into two semi circles and attach them together with jam. Then once again use your imagination for the details of the ship. Hope this information was useful. 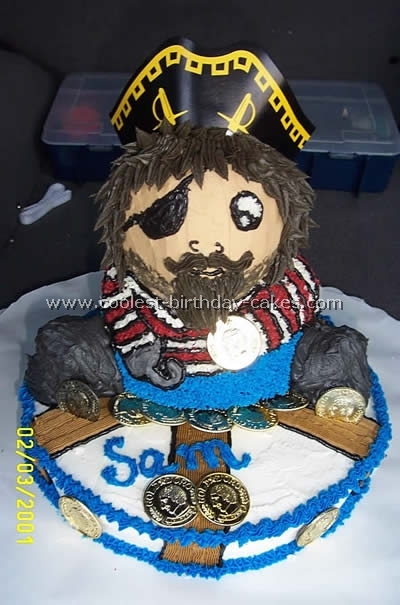 This pirate party cake was for my Son Sam’s 4th birthday. We had the party at a park that the playground area was a pirate ship so we thought we would make it a pirate themed party. The cake was Duncan Hines (is there any other?) yellow cake and was baked in a Wilton stand up bear pan. I cut off the ears of the bear with a serrated knife and "Voila!" a pirate. I used Wilton premixed butter cream frosting in the can (saved loads of time) but make sure you mix it well before tinting. You can add butter flavoring as well but mix well before tinting. I bought a cardboard pirates’ hat and cut it to size for the cake pirate and curved it while I wedged it down into the pirate party cake. The bottom was supposed to resemble a ship’s wheel (I’ll let you be the judge of that!). I used two wooden dowels (cut to the height of the bottom cake) and a separate cake board between the layers to support the weight of the pirate on the "Ship’s wheel". If you sprinkle your bottom layer with a little sugar before adding your second layer, the board will not stick and remove frosting from bottom layer when you remove top layer for cutting (nobody ever wants the part that has no frosting)., Around the base, I used store bought plastic coins. This pirate cake was extremely easy and turned out SO cute! 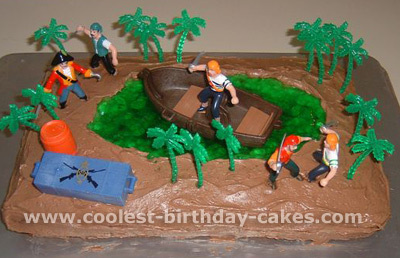 I modified this pirate cake from a "Golf Course" cake idea to fit my son’s Pirate obsession for his 4th birthday party. One package (2-layer size) yellow or white cake mix, one cup of boiling water, one package (4-serving size) green or blue Jello, 1/2 cup cold water, chocolate frosting, prepare and bake cake mix in 13×9 inch baking pan as directed on package. Cool completely (or freeze a few minutes to make cutting easier). Invert cake onto large platter; remove pan. Using small "ocean" from center of cake. Stir boiling water into dry gelatin in medium bowl until completely dissolved. Stir in cold water. Refrigerate about an hour until slightly thickened (the consistency of unbeaten egg whites). Pour thickened gelatin into center of cake. Refrigerate for three hours or until set. 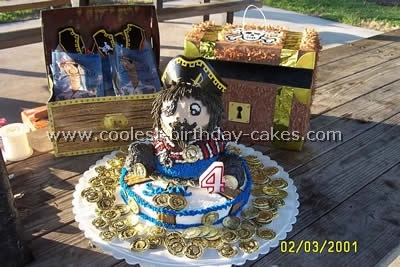 Frost borders and side of cake with chocolate frosting and then place toy pirates, palm tree toothpicks or anything else you would like to add on your pirate party cake. Adding a boat on the Jello ocean is an especially cute touch (or adding Swedish fish to the ocean ‘water’). Keep cake refrigerated until serving.